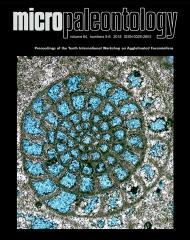 ABSTRACT: Upper Miocene (lower Tortonian) foraminifers are a little-known group of organisms in the Pannonian Basin System of the Central Paratethyan realm. The scarcity of the mostly endemic species in the sedimentary record is caused by changes in ecological conditions at the end of the Miocene epoch when the paleogeographical evolution of the area resulted in the striking changes in seawater chemistry. Nevertheless, they may exceptionally form a significant component of microfossil assemblages. The most abundant species within all studied samples (Trochammina kibleri Venglinsky 1961, Miliammina velatina Venglinsky 1961 and Miliammina subvelatina Venglinsky 1975) are here investigated in detail and compared with previously published data from localities across the entire Central Paratethys area. The co-occurrence of other taxa, as well as sedimentological and isotopic data allow us to better constrain their environmental requirements and the sedimentary environment in marginal facies of the Late Miocene Pannonian Basin System. These results confirm the ecologically constrained conditions during the deposition of the upper Sarmatian to lower Pannonian sediments.